The messenger's ghostly words tickled her ear and caused the shaking to cease. Mariella's eyes snapped open. The flame of fear was immediately snuffed out and replaced by something that burned even hotter-the spirit of power, tempered by love, directed by a sound mind. She lifted her chin and stared at the wall of churning blackness. It was then that the lightning struck. She basked in its power, for the lightning was hers. It is here in the depths of the mountain and the heights of the stars that the saga ends. One way or the other, it ends. This is it! 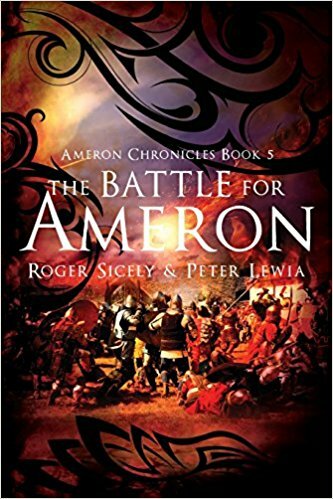 The end of The Ameron Chronicles! I can't believe that it's already over! I read this entire series in less than two weeks and now I'm bummed that there wasn't the next book in the next series to pick up by these two authors. What did I like? What didn't I like is probably a better question. Every time I had a moment I was picking up this book. I had to know what was going to happen to all of the characters that I had come to know and to love. Would the two couples end up together? Would they defeat the bad guy(s)? Would they save the kingdom of Ameron? Would the chosen reclaim their lands? What role does the baby from an earlier book have in the future of this kingdom? So many questions and I'm happy to report that most of those were answered. If I have one complaint, it's that not all of my questions were answered. The authors had assured me that this was the complete tale but based on this final book and especially the epilogue, it's clear that there were intentions to either have another book or to launch another series. I sincerely hope that's the case because it's going to bother me for ages that I don't know some of these answers. Just like my other reviews, I can't help but tell you to bug these authors. Get this series and then "harass" the authors into writing additional books because you're going to want to know the answers that I want to know. The easiest way I've seen to reach the authors is via their Facebook page. Don't hesitate to buy the entire series at once. Heck, the holidays are coming. If you know of a fantasy lover, this would be a great gift!